Do you share our passion and courage? Do you want to help us fight for a cure for childhood cancer? Do you BELIEVE? If you can’t help us financially, you can help spread the word by completing a Random Act of Kindness for a stranger. 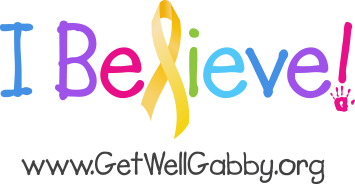 You can also help us show the world just how far the Get Well Gabby Foundation reaches and then show us a sign. Today 480 children will receive a diagnosis of cancer – 36 of them in the United States. The rates of childhood cancer are increasing every year. Many types of childhood cancer, like Gabby’s, remain terminal upon diagnosis. For the lucky ones who do survive, they often have long-term effects for the rest of their lives. Join us. Believe that you can help!